If you’re looking for paper crafting inspiration Paper Pumpkin is here to inspire you and bring creativity to your door each and every month. Paper Pumpkin is a subscription kit brought to you by the folks at Stampin’ Up. When you sign up you’ll get a box full of just about everything you need to complete multiples of that months project along with an instruction sheet and a link to an on-line video tutorial. Kits might include things like a clear stamp set, blank cards and envelopes, ink pads, stickers, embellishments, washi tape, twine and more. In most cases scissors, adhesive and clear stamping blocks are all you might need to complete the projects. The kit for March included black and white pattern cards, blue envelopes, dimensional stickers, a clear stamp set, diecut and punched cardstock layers, an ink pad, embroidery thread and a needle, everything (except a stamping block) to make 9 fabulous stitched cards. For my cards (shown above) the left carded followed the included instructions and for my other card on the right, I changed it up and made my own design, I even stamped the back of the envelopes. If you’d like to be inspired and get crafty every month with a Paper Pumpkin kit you can sign up here or talk to your Stampin’ Up consultant. The cost is $19.95 a month and once you sign up you have the opportunity to purchase any available past Paper Pumpkin kits too. Or you have a chance to win this months Paper Pumpkin kit! The generous folks over at Stampin’ Up are offering to giveaway a kit to one lucky Craft Gossip reader, simply leave a comment below to be entered. One comment per person, open to US residents only. Giveaway runs from today through 3/29/15. But if you don’t win this month check back next month because each month we will be giving away one Paper Pumkin kit, how awesome is that?! Oh, I’d love to win that kit. Thanks for a chance. Your cards are cute, it’s why I come back often to check. Loved the popup from before too. This kit looks fantastic, You can always count on Stampin’ up for such beautiful kits. The kit looks great! Thanks for the fuN! I love kits! Thanks for the chance to win! Thanks for the chance. Would love to win this. I love the colors on the cards! Thank you for the chance to win. Looks like a great giveaway. Thanks for the chance to win. Wow, this is a cool idea! I have to tell my mom about this because she loves scrapbooking! Nice giveaway. Thanks for this chance. Lovely kit. It would help me make some quick thank you cards I often need. Beautiful cards! I would love to win! I’m in search of a new hobby since recently becoming disabled. It would be nice to actually have something to do on my lesser of my pain days, maybe I’ll win, I’ve never won anything and what better to win is something to start a fresh new hobby while awaiting my disability. Oh my!!! I would love to win this kit!!! Totally awesome. I would love to win this paper pumpkin kit! It looks awesome!!! What a wonderful kit. I’d love to play with this! I would love to win this kit to try. I am on a limited budget and it would be great to be able to try one first for free. Wow this kit looks fabulous! thanks for a chance to win! What a fabulous giveaway! Mahalo for the op to win. How exciting that someone will win this fun kit! I am interested in this kit. Thru 3/31 Stampin’ Up has some of their Paper Pumpkin subscriptions on sale! Wow, love these trendy looking cards and would love to give the kit a try! 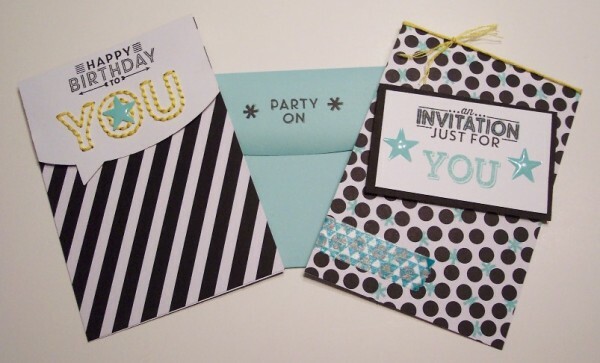 Stampin Up products are always wonderful! Glad Craft Gossip brought this to my attention. What great cards!! I love the stitching and the bold black and white papers! I am already a big fan of Stampin Up so know that they make quality products! Thanks for the chance to win! Thanks for the chance to win this great kit! This would be a fun project. Thanks for the chance to win it. Wonderful! Thanks for the opportunity to win! Love the different shapes in this kit; thanks for the opportunity to win it!